31 days of festval sees arrival of more than 2500 horses at major horse carnivals in Maharashtra. Chetak Festival, Sarangkheda is an age-old pastoral fair of horses that has been transformed into a month-long celebration. Mumbai: Maharashtra Tourism Development Corporation has organised Sarangkheda Chetak Festival 2017 from 3rd December 2017 to 2nd Jan 2018 to attract domestic and foreign tourists in Nandurbar district. 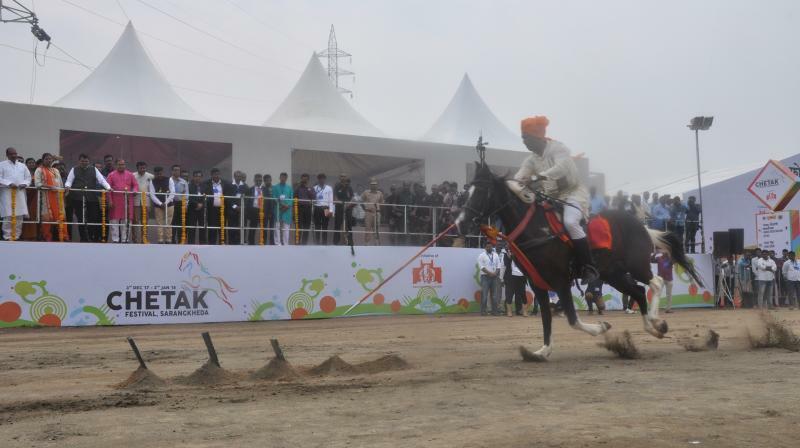 The 31 days of Sarangkheda Chetak Festival 2017 has observed the arrival of more than 2500 horses at the major horse carnivals in the State of Maharashtra. The first day of the festival also exhibited horse dance shows and pawara, a tribal dance by the locals of Nandurbar district. The festival was graced at the hands of Chief Minister Devendra Fadnavis in the presence of Minister of Tourism Jaykumar Rawal, Nitin Gadre (IAS), Principal Secretary, Tourism and Culture, Government of Maharashtra, Vijay Waghmare, (IAS) Managing Director, MTDC , Aashutosh Rathod, Joint Managing Director, MTDC and other stakeholders. The festival is held in the attractive rural localities of Northern Maharashtra on the banks of Tapi River for the last 300 years. The Maharashtra government is trying to create awareness about the festival and Nandurbar district to attract both national as well as worldwide tourists to this emerging holiday destination. MTDC and Department of Tourism, Government of Maharashtra is dedicated to take this festival to a global podium through the development of infrastructure, advertising and promotion. MTDC has planned to develop a horse museum for travelers that will inform them about the numerous qualities of breed, marking, lifespan and color etc. of horses. The Government has sanctioned Rs 4.98 crores for the museum and the dome shaped horse museum will be constructed on 6.5 acres land along the Tapi River. The other amenities like art gallery, exhibition venue, audio-visual room, food stall, shops will be made in the museum. Through these steps, Department of Tourism, Government of Maharashtra and MTDC desire to increase the economic and tourist footfall in Nandurbar district. Speaking at the Occasion, Shri.Jaykumar Rawal, Minister of Tourism & (EGS), Government of Maharashtra. “It is a privilege to promote the rich legacy of horses and the Department of Tourism and MTDC is optimistic to take this festival on the global platform. Sarangkheda, a small village with the population of 10,000 citizens organising this festival from more than 300 years."